Are you looking for a good portable toilet that you can take virtually anywhere with ease? Do you want something that will provide you with more of a traditional experience, yet gives you a level of consistency as well? Holding 4 gallons of water and 5.5 gallons of waste water, the Thetford Porta Potti offers you a good portable solution that is extremely user friendly. There aren’t any complicated steps required to use this unique design. You just flush and go! Best of all, you can save over 40% off the MSRP by shopping for this item on Amazon today! 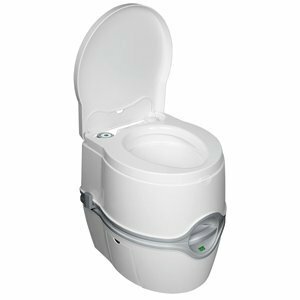 What Are the Features of the Thetford Porta Potti? The primary feature we really loved about this particular portable toilet is that the design is completely integrated. This includes a place for you to store toilet paper within the confines of the toilet so that you’ll always have a supply. It offers a traditional sitting experience, is surprisingly comfortable, and the release seals are nice and tight so you won’t have any issues with leaks while you’re transporting this particular toilet. it is extremely easy to use and the overall craftsmanship of this portable toilet is extremely good. Is There an Advantage To Owning This Particular Portable Toilet? We really love how this toilet sits at a regular height. Unlike other portable toilets, you won’t find a compromise in quality to achieve the added height either, which is a definite improvement. It’s stable on a firm surface when the water tanks are filled and it uses just a small amount of water, so you’ll get about 50 flushes from the toilet before you need to change it out. It’s sturdy, solid, and can support large individuals with ease. If there was one place where we’d like to see an improvement in this toilet’s design, it would be with the lid. It’s not the firmest lid in the world and is not something that you’ll want to use as a chair if you need a quiet moment somewhere and this is your only seating option. The bottom line is this: you can put the Thetford Porta Potti through a lot of tests and it will still preform more than adequately. If you’re in the market for a portable toilet, this is definitely one to consider owning. Click here to compare prices on Amazon and get the best price on the Thetford Porta Potti.